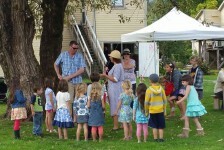 Children are introduced to how life was in the 1920’s day at Kilby’s Pioneer Days! Discover the differences in child’s lifestyle through fun, interactive games and activities. Learn the hands-on life skills of settlers; like needle crafts, making butter, doing laundry, and making ice cream. Old fashioned games, chores on the farm, being a postmaster and even a storekeeper are all part of this weekend event!